punkscience: are the Tory Scum mining Westminster contact records for their propaganda spam? are the Tory Scum mining Westminster contact records for their propaganda spam? Really what it says is irrelevant. I would never listen to a word a Tory said on principle and in the interests of preserving my mental health. However, this email was sent to my personal email address. I don't know how the Conservative party got hold of this as I can guarantee that I have never corresponded with them. Even if I had I would never authorise them to send me unsolicited material. Why would I be interested in their propaganda? 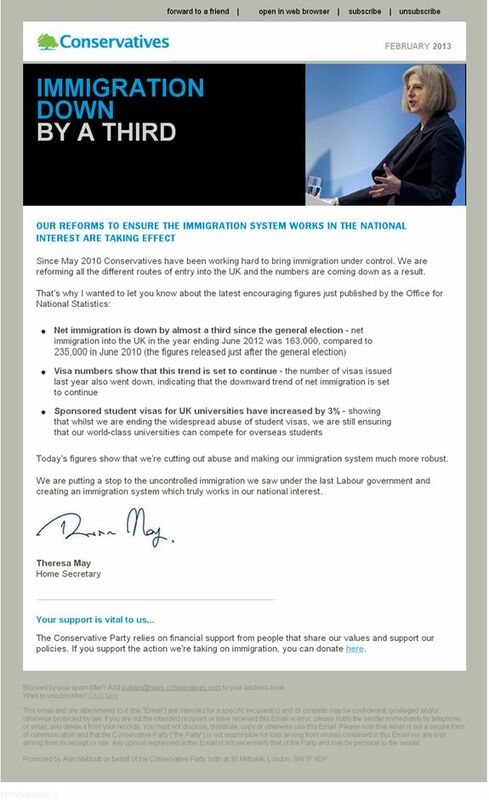 So how have the Conservative Party of the UK got hold of my email address and what makes them think its okay to spam it? This email address is publically visible on the internet but not associated with any information which would allow the Tories to identify me as a target. Unless I have slipped up in registering for some website and forgot to tick the "don't allow us to sell your personal info for profit" box, which I'm always careful to do, the only way I can think of is them mining Westminster resources such as the ePetitions website and ministerial contact records, with which I have communicated via that email address. If true this is a gross abuse of my private data and is clearly illegal under the Data Protection Act. I have replied, of course demanding to know how they obtained my email address but I doubt The Scum will be forthcoming. I would be interested to know if anyone else has received such an email and can confirm or deny my suspicions. I didn't get that one but I do get them from her and other Tories like Cameron, Osborne, Johnson, Shapps, Warsi etc. Thing is they arrive in my ISP Primary account, which is NOT public domain and which I have not used for over 10 years even for personal stuff.